Wim Hof is a Dutch athlete known as ‘The Iceman’ because of his remarkable ability to withstand extremely cold temperatures. By consciously hyperventilating, he is not only able to endure the cold, but can also influence his heart rate, adrenaline levels, and blood alkalinity, amongst other things. He now travels all over the world, teaching this special breathing technique – termed the Wim Hof Method – to others. He believes that the Wim Hof Method has the ability to alleviate a number of health conditions, and has worked extensively with scientific researchers all over the globe to prove the efficacy of his Method. We were delighted to get the chance to speak to Wim about his Method and his incredible journey. His Method is based on three pillars: cold therapy; breathing; and meditation. Wim explains that controlled exposure to the cold can bring a range of health benefits, including reduced inflammation and enhanced immunity. Anyone who has partaken in a Christmas Day swim in the Irish Sea, for example, can attest that as terrifying as the experience might seem beforehand, you are left with an amazing sense of invigoration and purity afterwards. The second pillar of the Method – breath – is vitally important. Wim says that by breathing in a way that heightens the oxygen levels in our body, we can access higher energy levels and reduced stress. The third pillar of the Method – commitment – is a simple willingness to dedicate yourself to the practice. Wim is firmly convinced that with focus and determination, you can eventually learn how to master your body and mind. Wim’s abilities were once viewed as scientifically impossible. In 2007, the first scientific analysis of the Wim Hof Method was carried out at the Feinstein Institute in New York. In 2011, the University Medical Center St. Radboud in Nijmegen ran a series of tests aimed at examining the capabilities of the Wim Hof Method. Their research concluded that Wim and others, through their use of the Wim Hof Method, were indeed able to voluntarily influence the autonomic nervous system: a feat which had previously been considered impossible. This groundbreaking finding was published in the PNAS and Nature journals, establishing the credibility of Wim’s Method and breeding curiosity among academia. He explains that researchers and scientists across a wide range of disciplines have since taken an interest in the Wim Hof Method, and a variety of promising studies are currently underway. ‘We need to learn that we are capable of more than we imagine,’ Wim explains. 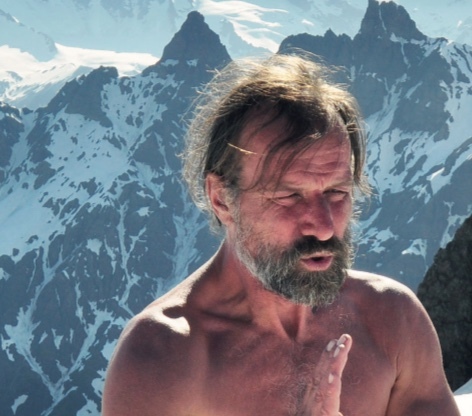 ‘We need to change the way we think about disease – both physical and mental – and to find out that there is more than meets the eye: there is the unseen, the spirit, the soul itself.’ For him, establishing a strong scientific grounding to the Wim Hof Method has been a vital part of that process. Wim credits much of the inspiration behind his work to his devout Catholic mother, who prayed for him to be made a missionary on the night of his birth. Wim believes that this prayer has helped him with his work by instilling him with the courage and determination to go out and spread a message that transcends all that humanity has previously believed to be possible, just as a traditional missionary would. Wim believes passionately in a world with an equal distribution of energy, resources and power, where no one feels as though they are unfree or unheard. In order for us to bring this type of world into our lived experience, we first need to access our own inner power. Though he has spent many years delving deeply into the power of breath and controlled cold exposure, and teaching this power to others, Wim does not feel that he, of his own self, is behind the Wim Hof Method’s principles. He sees himself as a channel for something far greater than he is. When he spoke to me about the true inspiration behind his work, I was very struck by the great determination and reverence in his voice. To listen to our full interview with Wim, just click here.